Drove down to Studley in Warwickshire (a small village just south of Birmingham) yesterday with Craig from work to get a demo for the camera I’ve been considering buying. It was a boiling hot day – so not the most ideal weather conditions for a long car journey! But it was a good chance to chat with Craig, because you don’t always get that much time to have a decent conversation at work. Anyway, we were given a demo for about an hour, going through all the features of the camera, and I decided to take the plunge and buy myself a camera kit!! It’s a Sony HDV camera – which means it can record in High Definitition, as well as DVCam and DV – so the quality’s really good, and hopefully it should be pretty future proof as well. And I’ve bought it on 12 months interest free credit, so I don’t have to worry about paying for it just yet! There are still a few more bits that I need to buy to make it into a full kit, but it’ll do me for now, and I’ll get the rest when I can afford it! Hooray!! I have a day off!! I’ve been working every single day now since the run – which adds up 24 days! So I’m feeling a little bit worn down, but am trying to tidy up the house a bit. 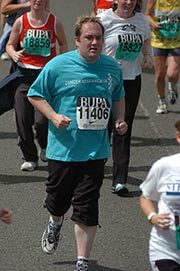 Found that my photo was taken at the run on the other week (there’s a company that takes photos of as may people as they can, and then try and flog them to you). Last year, I managed to avoid being snapped, but they caught me this time during the last km of the run. So I thought I’d buy it to prove to people that I really did it – athough it cost me £20 for just a copy of it on CD! Don’t know whether I’ll ever print it out, but I reckoned it’d be good to have a decent copy myself. Not done any more exercise since that day! To be honest, I’ve not really had the time or energy with all my work, but I may try and go back to the gym again this week. Not promising anything though!! Anyway, that should be the last time I go on about the run… the only exception will be when I know how much cash I raised! The other thing that’s happening at the moment is that I’m thinking of buying myself a decent video camera – but it’s not cheap! I’ve given the suppliers a call to arrange to take a look at one before making my final decision, so this time next week, I could be further in debt! !